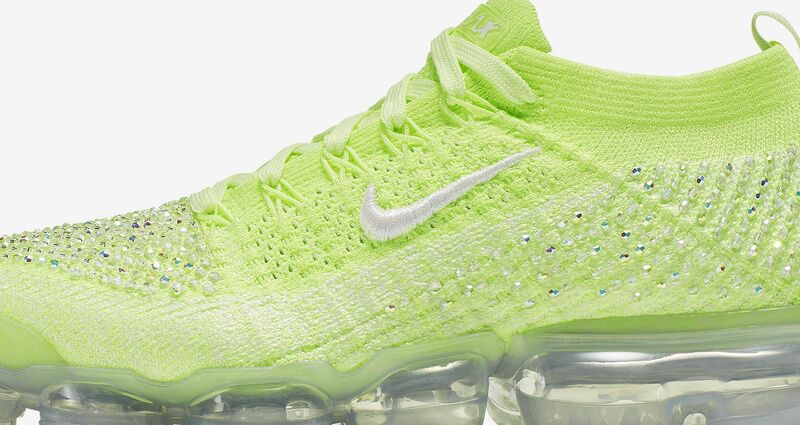 Glamorous Nike Vapormax Flyknit 2 Swarovski for women has arrived. I would say that 2018 was the year of decked up sneakers. From Selena Gomez’s dress and cool Puma sneaker to Chiara Ferragni’s glitzy collab with Converse, our favourites have turned the athleisure into an amazing trend. It seems that the footwear giant was quick to pick the vibes of glamorous kicks. Nike collaborated with world renowned jewellery atelier Swarovski in lending their luxurious build to come up with one of their finest silhouettes. Nike is synonymous with style and use of latest technology that keeps your feet comfortable even while running and walking. This isn’t for the first time Nike collaborating with Swarovski. In previous years, they got together on black and silver blinged out sneakers. Following the success of their association which produced the Air Max 97 LX “Metallic Gold”, they teamed up again. This time delivering a glittering version of the Air VaporMax. 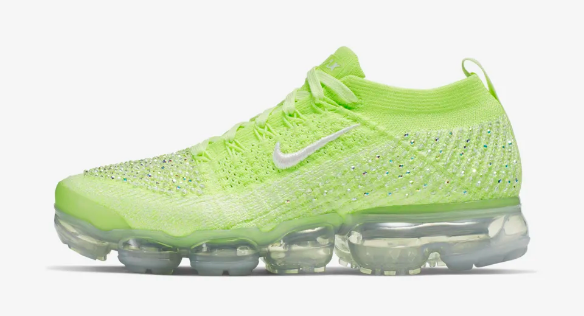 Flyknit 2 LXX is a part of Nike’s summer 2019 releases for women exclusively. Trust me, this one is the most eye catching by far. What’s so special about VaporMax Flyknit? The Nike Air VaporMax is a new running shoe that was released in 2017. Testament to the brand’s strides in innovation, it features the most air in any Nike sneakers. The unique design strips away unnecessary elements of a shoes like the midsole by sitting the Flyknit upper directly on top of large sectioned air units. It is currently the lightest Air Max sneaker ever made. The Volt-colored and crystal-infused pair is the most colourful kicks yet and it carries a hefty retail price tag. Studden with over 1,000 dual finish Swarovski crystals, they are hand embroidered. These crystals create a luxe and sparkling aesthetic for this silhouette. 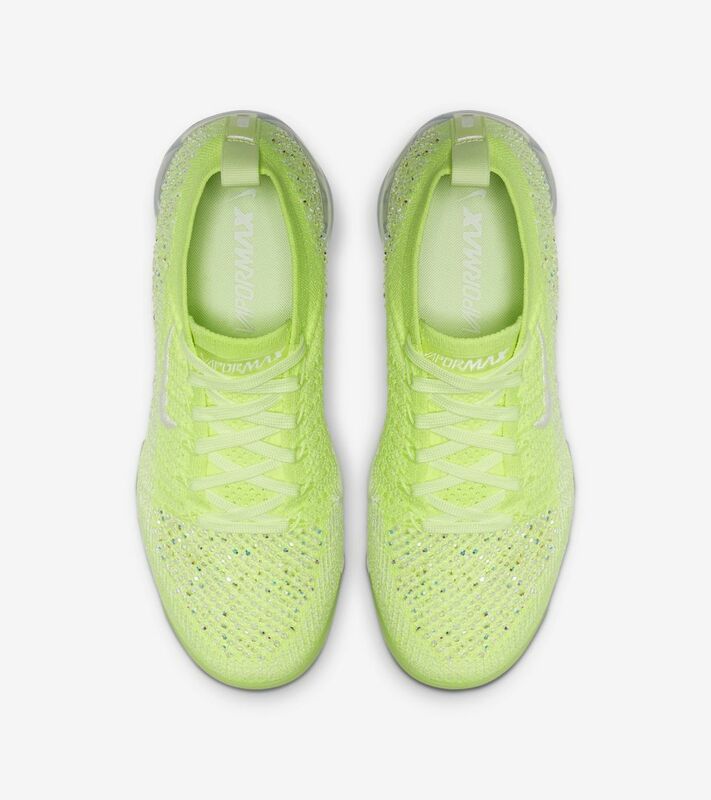 These kicks retails at $500 in two shades Volt and White, and the style code is AT5673-700. Don’t miss to grab one for yourself from Nike site. Believe me, these elegant sneakers will encourage you to work out.